BABY KOALA FOUND IN BACKPACK! Why would you choose to hide there, you crazy koala! 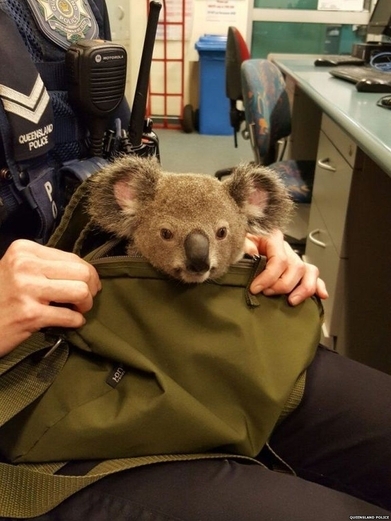 Australian police have found a baby koala in a woman’s backpack whilst conducting a routine police search. The koala is said to be 6 months old and the woman has claimed to be looking after it. The baby kola weighs 1.5kg and had been given the name Alfred! Police have taken Alfred into custody where he is being well looked after at a station in Brisbane. Alfred’s leading lady however, has been arrested by the police.